Maud Nathan was an advocate for women’s rights and better conditions for working women. She was born into an old, privileged New York Sephardic family and summered in Saratoga Springs, NY as a married woman. Her sister, Annie Nathan Meyer, was the founder of Barnard College. Her cousin, Benjamin Cardozo, was a Supreme Court justice and New York Court of Appeals judge. Nathan had one child, Annette, who passed away at the age of eight. In an effort to handle her grief over the loss of her only child, Nathan became involved with charitable activities. Nathan was on the board of directors for the Hebrew Free School where she taught English to Jewish immigrants. Nathan was a founding member and the president of the New York Consumers League from 1897 to 1927 which focused on bettering the working conditions for shop girls and clerks. From her time lobbying the state of New York on consumer issues, Nathan realized that legislators did not care about the opinions of non-voters (women) and that women did not have a voice without the vote. This led to Nathan becoming involved in the suffrage movement. Nathan became a lecturer on women’s suffrage on an international stage. 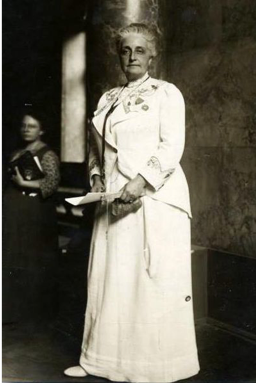 She was appointed as the head of the women’s suffrage committee in the National Progressive Party. In 1897, Nathan was the first woman to speak at an American synagogue (Shearith Israel synagogue). She gave a speech named “The Heart of Judaism” where she encouraged Jews to be work for social justice and reform. Nathan believed that Jewish women had a civic responsibility toward social justice and political participation. Nathan’s husband, Fredrick, supported the suffrage movement and led the Men’s League for Equal Suffrage. He often was at his wife’s side during demonstrations and was sometimes referred to as “Mr. Maud Nathan” in the newspapers. In 1913, Nathan won the New York Herald Prize for best letter in favor of woman suffrage.